One African elephant is poached for its tusks every 26 minutes. That’s 55 a day. “Sketch for Survival” aims to raise awareness about species extinction through the medium of art while also raising significant funds to fight wildlife crime. 26 minutes to make a difference: Our seven venue touring exhibition and auction celebrates some of the world’s most loved wildlife with the help of acclaimed professional artists and celebrity supporters who are asked to capture one of their favourite species in a 26 minute sketch or other signed artwork. All artwork is auctioned at the end of the exhibition tour to help raise conservation funds . This year we are delighted to partner with African Parks to help them establish a new working dogs programme in Garamba. Specialist dog units offer many benefits – both for wildlife and community. We hope the canine unit will help to safeguard elephant, who have been decimated by poaching, as well as rare Kordofan Giraffe. 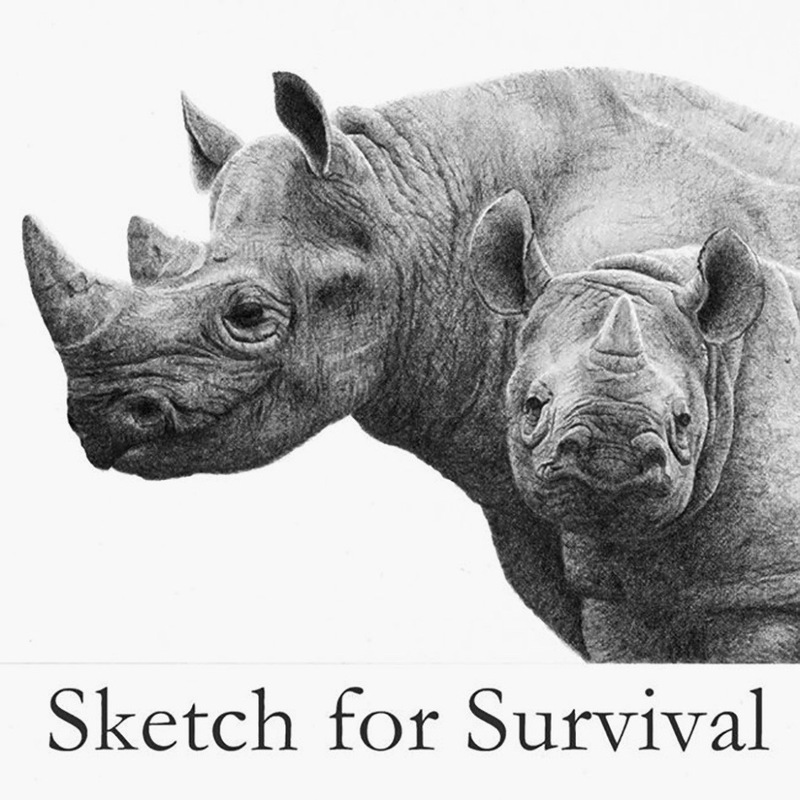 Selections from Explorers Against Extinction’s Sketch for Survival will arrive at Salmagundi for three days only – November 15,16, & 17. The complete collection will also be available to view and to bid on via our online auction site. Registration opens in September. The auction will conclude on the evening of Sunday 25th November 2018. Many artists and celebrities from our successful 2017 campaign are generously supporting this campaign again and by word of mouth Sketch For Survival is expecting an even bigger and better collection of art in 2018. We already have original artworks pledged by artists across some 22 countries and celebrity artworks donated by Dame Judi Dench, Stephen Fry, Richard E Grant, Mary Berry, Frederick Forsyth, Dame Helen Mirren, Sir Ranulph Fiennes and Colonel John Blashford Snell. The Salmagundi Club is located at 47 Fifth Avenue between 11th-12th Streets in Greenwich Village, with galleries open from 1-6pm daily. Free and open to the public. Next Next post: The Fabulous SVA Makers Market is set for Saturday, November 17th!